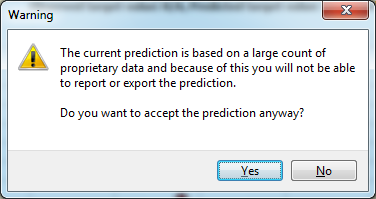 I'd like to export a QSAR Toolbox Prediction Report for carboxylic acids, but I'm running into an error that's new to me. Is there a way to specify use of non-proprietary data? By the insistence of the donators the "Rep Dose Tox Fraunhofer ITEM" and the "ECHA CHEM" databases have their data marked as proprietary. If you don't like to use them please uncheck the databses from the databases selection panel.